There are plenty of us who don't know that much about computers, other than how to use them. With some luck, maybe the last computer you purchased (or was purchased for you) is still working. However, once it's time to go shopping for a new computer, it can get a little nerve-racking if you haven't kept up with the latest technology. And for sure, computer technology changes and improves year by year. There are magazines you can buy and online articles you could read, but they can get pretty technical...and overwhelming. You just might decide to go out and start shopping, especially if you don't have a lot of time (or patience) for research. If that's the case, here is a list of six tips to keep in mind as you embark on shopping for a new computer. It's not a to-do list. It's more of a don't-do list. These suggestions are meant to get you in the right frame of mine before you plunk down your money our credit card and walk away with the wrong, shiny new computer under your arm. 1. Don't over-buy. Instead, get just what you need. There's a very good chance you don't need the "most" of anything in a computer: The most power, the most memory, the most bells and whistles. (If you do, you probably already know it.) And you don't have to worry about missing out by not getting the latest high-end offerings. As you'll quickly see, there is a big difference in price for getting maxed out on features. If you go shopping with a clear idea of what you do on a computer (or want to do) a salesperson can steer you to the best computer choices. 2. Don't ignore the operating system. Know what runs your computer. An operating system (OS) is the brains of your computer and there are so many off-shoots of existing operating systems out there that you can easily get confused. Find out the name of your current operating system so that a salesperson will know what you've been using and how current or out of date your system is. One big mistake you could make would be to buy a computer with an operating system that will be phased out in a few years or that you can't upgrade when the time comes. Finally, if you're thinking of switching from a PC to an Apple computer (Mac), or vice versa, you'll want to let the salesperson know that as well. 3. Don't assume all computers are alike. They vary in a variety of ways. Because technology changes so fast, so do computers, but not all at the same time. There was a time when not all computers had CD/DVD drives. Then they all did. Now, there are some that don't have them again. Also, ask about the number of ports for plugging in devices like a mouse, printers, cameras, etc. As you looking at different computers, ask the salesperson to show you how they differ physically on the outside, as well as on the inside. And don't assume that one brand's computers will offer the same features. They won't. 4. Don't get lured by the lowest-cost choice. Pay enough to make a smart choice. There are some office supply stores that offer very inexpensive "new" computers. By inexpensive, we mean between $250 and $400, which is a small price to pay for a computer. However, you wouldn't be getting a modern computer (meaning, today's latest technology) and you might not be getting even the top tier of an older model. You could be simply be getting a below-average, ordinary computer that has been lingering in the warehouse. Will it work? Yes. Can you send email with it and shop online and do homework? Probably. But if and when it breaks down, it probably won't be worth fixing and you'll be back to buy a new computer again. Tip: Ask the salesperson, "What would be the downside of buying this computer?" They'll tell you. 5. Don't hesitate to ask questions. And get all your questions answered. A funny thing happens when you ask a lot of simple questions—you start learning so much more. A computer store sells to all types: tech-savvy people, first-time buyers and everybody in between. They're trained to know the features of their computers in order to help anyone who comes through the door. Take advantage of their knowledge! Ask any and all questions that come to mind. Don't be afraid to look dumb or technologically challenged. The best place to start is to tell them what you have now and what you want to do with a new computer. If indeed you're not too tech savvy, tell them you want to learn more. They'll be glad to help you. 6. Don't buy at the first store you visit. Instead, shop around and compare. 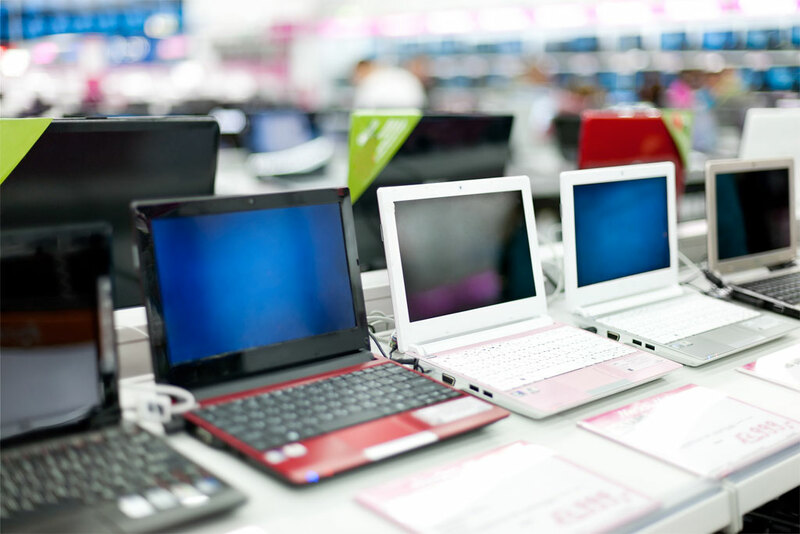 If you're lucky, there are a few retail stores near you where you can shop for a computer (electronics store, department store; warehouse store, etc.). Be sure to visit several and try to avoid buying a computer at the first store you go to. As you shop around, you might find that a different store has a wider selection; and they might simply have a better computer for you. You might also stumble across a great sale. Shopping around will also help you get a feel for all the computer brands, chip makers and operating systems/versions that are out there to choose from. Do make it an exciting time. If you allow yourself the time to shop around, ask questions and you avoid making a quick decision on price (high or low), you'll give yourself a good education in a short amount of time. Then, when you finally do pay for and walk away with your new computer, you'll feel confident that you made a great choice for yourself.